Let me preface this by saying, I've been on a ramen kick. We're talking multiple trips to Ippudo. 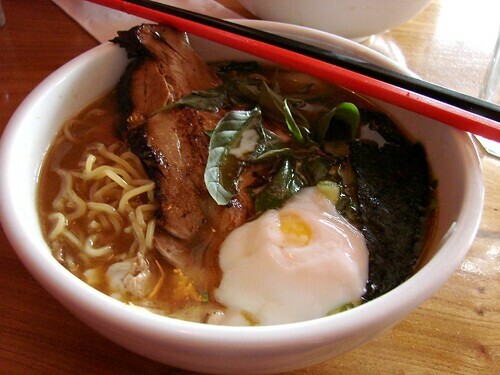 My month to date ramen intake has thus far surpassed my 2008 year to date ramen intake. What can I say? When I'm feeling sniffly, I just crave soup. Lawman has been humoring me, but his patience is wearing thin. So when I read that Zuzu's Green Curry Miso ramen was "unlike any other broth in the entire city." I knew I had to give it a try and I'm so glad I did. mmm... that's an awesome bowl, and for just $10 dollars! tasty stuff especially since the weather is so chilly lately. if you happen to be near the UWS soon, do not miss Water Moon-"big bowl noodle soup" i get the coconut curry, udon noodle and grilled shrimp. Its perfect amount of spicy-ness, chewy noodles and yummy veggies clears my nose immediately and always makes me feel better...and your post just made me crave it!